Challenge the olympic world records! Athletes from all over the world converge in a single location to proove their worth, in the greatest sports competition of all time: The olympic games! 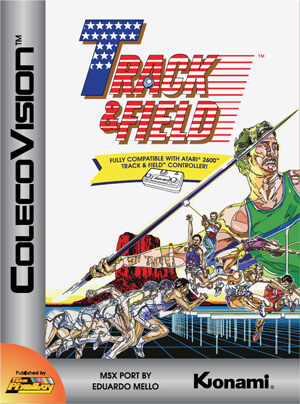 In Konami's Track & Field, you can join them and get a nice work-out in the process! 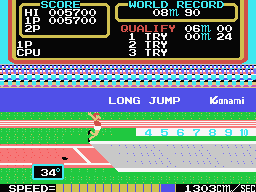 One or two players participate in such time-honored olympic events as the 100-meter dash, the long jump and the hammer throw. 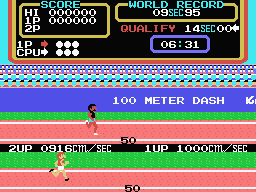 In each event, the player must qualify against a pre-determined time or distance in order to proceed to the next event. If not, the competition is over. The points added to your score after each event depend on your athletic performance. Can you make your home country proud?